FPS can have a huge impact. I have a lot of different source types, but feel free to slim it down based on your needs. Last edited by QBhd; 15th August 2017 at 23:50. Hey Asmodian, ATM I'm using a bunch of these single commands and it's fine but I'd like to tidy it up and have as a single command with an OR or whatever. if (srcHeight <= 480) and (filepath = "D:\Video\Anime\*. *") "Anime 480"
if (srcHeight <= 480) and (filepath = "D:\Video\Cartoons\*. *") "Anime 480"
if (srcHeight <= 480) and (filepath = "D:\Video\Anime\*. *") or (filepath = "D:\Video\Cartoons\*. *") "Anime 480"
What's the proper syntax to achieve it? Cheers. if (srcHeight <= 480) and ((filepath = "D:\Video\Anime\*. *") or (filepath = "D:\Video\Cartoons\*. *")) "Anime 480"
That should work. You want filepath A OR B to be tested first for True/False and then have that result AND srcHeight tested to both be True to activate the profile. The extra parentheses around the filepath clauses should do this. I also have a script for various resolutions and frame rates but I try to combine them when possible, e.g. 720p60 using the same profile as 1080p30. ElseIf ((deintFPS<31)AND(srcWidth<=1920)AND(srcHeight<=1088)) OR ((deintFPS<61)AND(srcWidth<=1280)AND(srcHeight<=720)) "1080p30"
ElseIf ((deintFPS<31)AND(srcWidth<=4096)AND(srcHeight<=2160)) OR ((deintFPS<61)AND(srcWidth<=1920)AND(srcHeight<=1088)) "2160p30"
ElseIf ((deintFPS<61)AND(srcWidth<=4096)AND(srcHeight<=2160)) OR ((deintFPS<121)AND(srcWidth<=1920)AND(srcHeight<=1088)) "2160p60"
Guys the frames are dropping again like dead flies!!! I thought all these issues were over, I just turned on the PC and away the frames are dropping again. 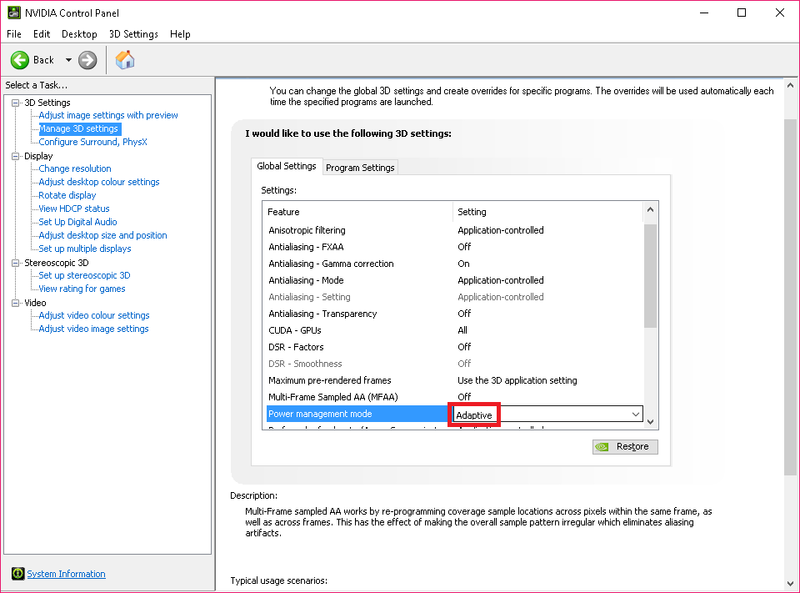 can you upload your OSD somewhere else and make sure the nvidia power settings are NOT set to "optimal". Sorry what do you mean to upload my OSD to somewhere else, did my dropbox one not show? Power settings not on optimal? Do you mean in Power Options? I have mine set to High Performance, changed it to Balanced (recommended) but it didnt fix it... Which one should it be on when using the Ti card? Should I remove madvr and re install it? this si by default set to optimal which is a very common issue. huhn you are absolutely brilliant!!! When the drivers we re installed it worked fine after that, it was just restarting tonight that the dropped frames started again... Maybe it kind of grabbed Adaptive last night but as it wasnt saved reverted back to optimal. Gee there are so many small areas us new comers can get trapped by. Is there anything else in that area that i have to be aware of? Is there anything that can ever revert it back to default again? Updating drivers sometimes does it - definitely does it if you do a clean install or use DDU. the reason it works with nnedi is that openCL is forcing your GPU to a high power mode while "optimal" and madVR are not good friends. i don't know if madVR can tell the GPU to use a performance mode but this is a general problem using madVR. the default nvidia settings are not working properly with madVR so this should be made very clear for the moment. Well said, in my config, I always add the player in nvidia control panel and choose use maximum performance, if I select adaptive, my rendering times are changing often, with maximum performance they are low and stable. Rendering times changing or being stable makes no difference, as long as you don't drop frames. Adaptive is usually just fine, as the GPU then adapts to the load conditions. So adaptive is the better choice, instead of prefer maximum performance? yeah. high performance is a waste of power. feel free to use high performance when you get in real troubles with adaptive. It can save on heat output (and perhaps noise) as the GPU would only run as fast as it needs to. Last edited by dvd1; 16th August 2017 at 15:55. With my 2GB GT 730 graphics card is it good to use madVR or the graphics card is too thick to have improvements? I downloaded yesterday the latest nvidia drivers, 385.28, and now 4k hdr videos stutter when playing in full screen. It was fine last week... 980Ti here. Anyone else?